Some understanding of the biochemistry of exercise is fundamental to any study of the factors that contribute to sports performance. It is the physical, chemical and biochemical properties of cells and tissues that determine the physiological responses to exercise, and yet the teaching of exercise biochemistry is poorly developed compared with exercise physiology. Where the subject is taught, the student often finds the approach somewhat daunting, with its focus onthermodynamics, chemical structures and metabolic pathways. Many students find the subject difficult, when it should not be so. 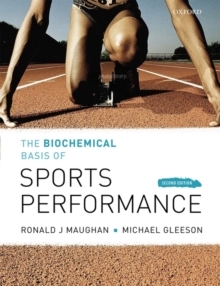 This book introduces the student of sports science or exercise physiology to the biochemical processes that underpin exercise performance and the adaptations that occur with training. The focus is on skeletal muscle metabolism and the provision of energy for working muscles and the principles of exercise biochemistry are introduced in a context that is immediately relevant to the student of sports science. Instead of the traditional approach of working through the main classes of biomolecules and metabolic pathways, the subject is tackled by considering the biochemical processes involved in energy provision for different sports events and the way in which limitations in energy supply can cause fatigue, and thus limit performance. Recovery from exercise is important for athletes who train and compete with only a limited rest period, and the biochemical processes that influence recovery andrestoration of performance capacity are also addressed. The processes fuelling the activities that contribute to sport form the core of this book, together with the changes that occur with training and the role of diet in providing the necessary fuels.